Rachel Von | The Journal Gazette Snider's Duce Taylor runs with the ball in the win against Concordia at Spuller Stadium on Friday. 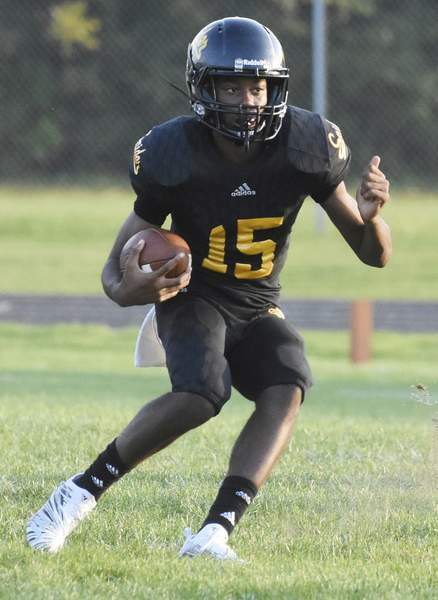 The Snider Panthers redeemed themselves in Week 3 of the high-school football season. After a thrashing at the hands of Carroll the week before, it was obvious the Panthers had studied the Concordia offense. With receivers like Kamari Anderson-Drew and Tyler Grossman, not to mention the hard running of Amir Drew, the Panthers shut the Cadets down en route to a 37-7 victory. Snider forced Concordia to go 2 for 10 on third downs and 0 for 2 on fourth downs. Concordia quarterback Jake Byrd frequently was chased out of the pocket and forced into errant throws. Concordia put up just 206 yards of offense, after totaling 624 the first two games. Warren Joseph's great play ensured there would be a great meal for his teammates on the Garrett defense Saturday. While the Railroaders lost 31-15 at Class A, No. 6 Churubusco, Joseph, playing just his third varsity game on the defensive line after converting from fullback, recovered a fumble in the end zone by Eagle quarterback Tom Richards in the fourth quarter to notch his first varsity touchdown. “Since the defense scored, we (got) breakfast on Saturday,” Joseph said. A delicious perk not only for Joseph's effort, but also an eye-opener of sorts. Joseph's recovery put the visitors ahead 15-14 early in the fourth quarter, giving promise back to a Garrett defense one week after surrendering 49 points to DeKalb. South Adams coach Grant Moser described his team's 21-3 win over Bluffton as “gritty” – and it certainly wasn't pretty. The Starfires were the more heavily penalized team, garnering nine flags for 95 yards, while the Tigers had seven penalties for 60 yards. That metric might undersell the impact of penalties on South Adams, which had two apparent touchdowns called back. It was also a rough night on the turnover front, as Bluffton's Hayden Nern was picked off twice, and the two teams combined for five fumbles. And when Bluffton's leading rusher, Everett Johnson, is removed from the mix, the rest of the Tigers run game combined for negative yardage. Bishop Luers improved to 2-1 with its thrilling 38-36 win over Homestead, giving it two come-from-behind wins over Class 6A schools. The Knights, ranked No. 8 in Class 3A, opened the season with a 21-20 victory over Carroll, scoring the game-winner in the final three minutes. Friday's win came as time expired when junior kicker Carter Drake drilled a 29-yard field goal. It also came after the Knights watched Homestead wipe away a 35-17 deficit in the fourth quarter, taking a 36-35 lead on Jake Archbold's touchdown with 2:34 remaining. On the Knights' sideline, they knew they had 21/2 minutes left to take the lead back. Luers started its drive at its 32-yard line and went into its two-minute offense to drive to the Homestead 12 in 10 plays. Senior quarterback Norm Knapke, who threw for 288 yards and two touchdowns, completed 5 of 7 passes on the drive. A few seconds later, Drake's kick went straight down the middle of the posts, and the Knights piled on top of him. “I thought Norm did a heck of a job keeping (the team's) composure,” Lindsay said. “The offensive line did a great job keeping their composure.